China's military put out a strong message on Taiwan on Saturday, vowing to "safeguard the territory of our motherland." The People's Liberation Army air force released a video and series of commemorative envelopes showing recent Chinese air force missions around the island, which Beijing views as a breakaway province, writes CNN. "It is the sacred duty of any PLA pilot to safeguard the territory of our motherland," reads the text on the envelopes, which feature pictures of PLA warplanes and pilots on flights near Taiwan. State-run news agency Xinhua reported Saturday that the images were taken by China's PLA pilots during missions around Taiwan that began April 18. "Every time we flew the H-6K bomber over the island, my comrades and I could clearly see the wonderful landscape of our motherland, before recording the scenes with cameras," it quoted pilot Wu Yuepeng as saying. "They're not only the witness to our efforts for a stronger country and a stronger military, but also witness to us carrying out missions in the new era." The Xinhua report was posted on China's English-language military website, alongside an article from the state-owned China Daily newspaper. "The recent live-fire drills carried out by the People's Liberation Army have sent an explicit and clear message -- we aim to pursue peaceful reunification with sincerity and great efforts, but we have the resolve, the confidence and the ability to defeat secessionist attempts in any form, to safeguard national sovereignty and territorial integrity," a spokesman for the State Council Taiwan Affairs Office was quoted as saying in the China Daily report. Other state-owned media also carried coverage of the PLA's missions around Taiwan. Broadcaster CCTV posted footage to YouTube of what it said was a flight around the island on Thursday. "The round the island flight is to test and improve the combat capacity of bombers that are included in the unit. Currently all our pilots are ready to take off and go into battles at any time, no matter how complex and severe the air situation is," bomber captain Chen Liang was shown telling reporters. "We have the resolve, capacity and faith to safeguard the national sovereignty and territorial integrity." The unit "was composed of fighters, early warning and surveillance aircraft, and H-6K bombers, which took off from various military airfields," according to CCTV captions. Meanwhile, the state-owned English-language broadcaster CGTN posted a video to YouTube Thursday that included footage of the air force's flights and headed "PLA stands firm against 'Taiwan independence'." CGTN correspondent Han Bin said that H6-K heavy bombers capable of carrying strategic missiles were among the aircraft to circle Taiwan in drills "aimed at thwarting any moves towards independence." His report included a media conference by defense ministry spokesman Wu Qian. "The secessionist activity in Taiwan has posed the greatest realistic threat to across strait relations and damaged the core interest of the Taiwan people," Wu said. "The activities we have taken were targeted at the independence groups and served to protect the well-being of the Taiwan people." PLA air force spokesman Shen Jinke was shown saying China would continue to patrol the Taiwan Strait "with multiple aircraft." "We have resolute will and sufficient capability to defend the country's territorial integrity," Shen said. The PLA air force flights are just the latest PLA military exercises in the vicinity of Taiwan. Earlier in April, the PLA navy sent the aircraft carrier Liaoning and its battle group for live-fire drills in the East China Sea. Last week, the PLA touted the deployment of DF-26 intermediate-range ballistic missiles with its Rocket Forces. The missiles can hit targets on land and at sea, China's Ministry of Defense said. A story from state-sanctioned Global Times posted on the PLA's English-language website said the deployment should be seen as "part of the country's warning to Taiwan secessionists" and their supporters in the US. 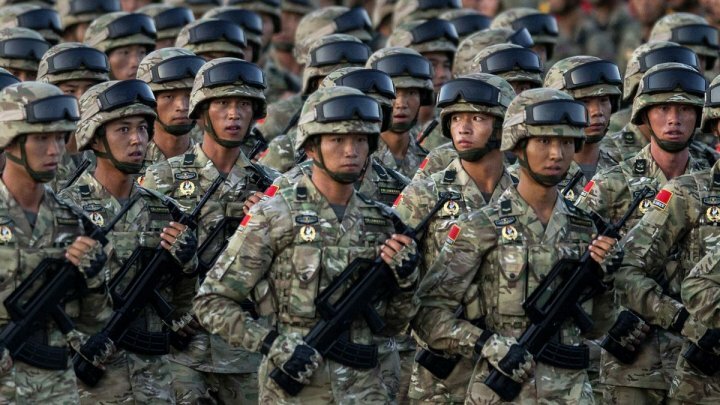 Coupled with the military around Taiwan, "it sends a clear warning that the US should act cautiously on the Taiwan question and not interfere in China's internal affairs," Global Times reported, attributing the opinion to Song Zhongping, a military expert and TV commentator. Though both Taipei and Beijing view the island as part of China, neither government recognizes the legitimacy of the opposing side, and there is a strong pro-independence sentiment within the current ruling party in Taiwan.